Discussion in 'MacBook Pro' started by mattmikulla, Jun 12, 2012. Ok. Let me know if I'm reading this right. From the tech specs the new MBP can support 2 additional displays plus the laptop retina display at once? Yes, the laptop display and two external displays. I guess that means you can use two mini-displayport (or Thunderbolt) displays or one mini-displayport and one HDMI. That was my biggest problem too.. I purchased the retina display and currently have the 24" cinema display that I use as my primary monitor. Now I'm not sure what to use as my primary monitor. The retina display is clearly better technology but I like the size of the cinema display. I also wanted to add on another another TBD to equal 2 external monitors but now I'm thinking I should wait to see if they release a TBD retina. I'm thinking if I get a TBD display I'm not going to like it compared to the MBP retina. I'm also hoping that we can attach any display and not just apple displays for this to work. Yes, you should be able to do that no problem. Just use two Mini-Displayport to VGA or DVI adapters, or an HDMI cable. 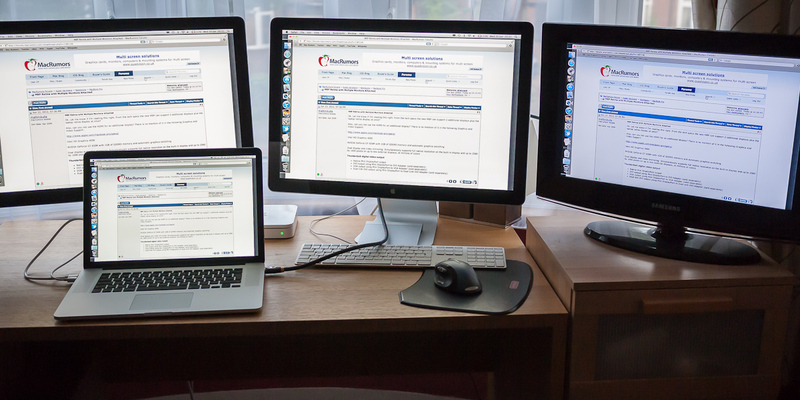 No need to use Thunderbolt-capable displays unless you need the extra docking functions. So, in theory, you could hang one 2560x1600 Monitor off EACH of the two Tb ports (total two), plus the native 2880x1800 Retina screen AND an external 1080p HDMI TV? All running different images. Right? We'll have to wait for people to try it. Apple only says that it supports the internal display plus two external displays. On the other hand, the non-retina 15" MBP states that it only supports the internal display and one external display, but it can actually support two externals in practice (as long as the first one is a Thunderbolt display). Great now I'm going to have to go buy a Thunder Bolt Display to add on to my Cinema Display.... I wonder when they will be updating the thunder bolt display to retina. I doubt there will be a retina Thunderbolt Display for a year or two, and even still they might keep selling the non-retina one because of the potential price difference. Also you wouldn't need to get a Thunderbolt display to have two monitors hooked to your Retina MBP, that only applies to the non-retina models. I was trying to figure out the same thing. I might get the retina mbp if I can use it to replace my desktop pc. I'm thinking maybe I could go thunderbolt to one dvi, hdmi to the other, and the other thunderbolt for ethernet. Does anyone know how I would attach two 24" Dell U2410 Monitors? Doesn't seem like HDMI will push the full resolution. "MacBook Pro (Retina, Mid 2012) can support an HDMI-compatible device on its HDMI port while also using two Thunderbolt displays." So does that mean I can just plug them both in using mini display plugs into both thunderbolt ports? what about 3 monitors I'm clamshell? HDMI should push full resolution. Also, doesn't that monitor have Mini displayport? Mini displayport fits right into the thunderbolt port. I can confirm you can run 3 external displays plus the Retina screen. I hooked up two Apple 24" LED displays to the TB ports and a Samsung TV to the HDMI. This amazing! Is there any kind of lag when doing this? Seems like it would be very taxing on the video card. I didn't notice any, I'm hoping to try it again and shoot some video. Have you tried multiple display and not just duplicate display? Yes, duplicating is pointless. It says up to two 2560x1600, obviously these have to be tb or DP or dual dvi. The hdmi will only support hd. I'm assuming there's no mini DP port, so we have to us a tb to DP adaptor? Looks like that's gonna be the way to do it. Either way, it's still gonna be duplicates only. And no, none of those displays are duplicated, they're all their own unique desktop areas.